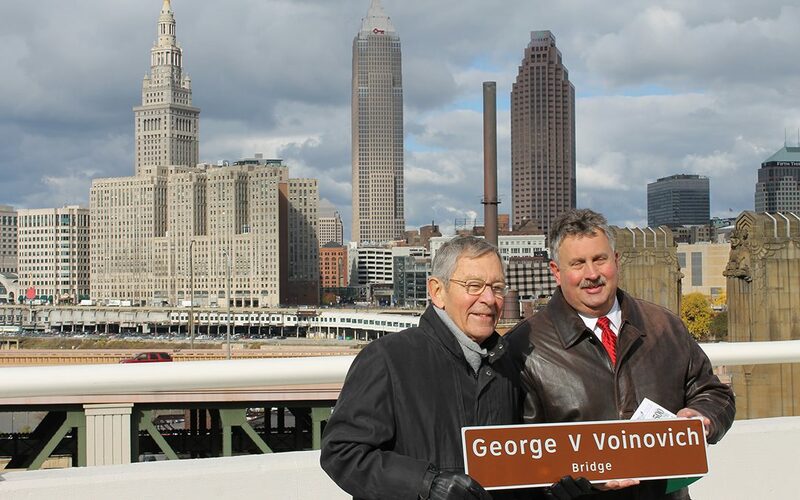 George V. Voinovich, left, and an Ohio Department of Transportation official at the November 2013 dedication of the bridges in Cleveland, Ohio, named after the late two-term Ohio governor and U.S. senator. Photo courtesy of ODOT. George V. Voinovich, who as a two-term Ohio governor and U.S. senator was a strong advocate for transportation infrastructure investment, died June 12. He was 79. “He was a leader in the passage of federal highway and transit laws in 1998 and 2005. Along the way, he also fought to reform the transportation conformity provisions of the Clean Air Act,” ARTBA President & CEO Pete Ruane recalled in a release. “George had an uncommon degree of common sense and was refreshingly candid, yet also demonstrated a willingness to work across the aisle on policy issues—qualities in short supply in Washington these days,” Ruane said. Voinovich was the 2009 public sector recipient of the “ARTBA Award,” the association’s highest honor. Voinovich, a Republican, spent more than 40 years in public office, including as mayor of Cleveland in the 1980s. He is survived by his wife of 53 years, Janet, and three children.